Want to try your hand at DJing? MCing? Break Dancing or Graffiti? Join us on May 26th at The Foundry (Bankmore Square) for a day dedicated to spreading positive HipHop culture. Learn from our team of talented performers, artists, and musicians. Check out our event page here. 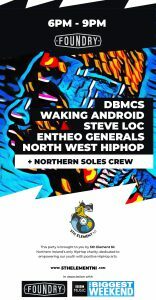 This is a free event to help promote our newly established charity 5th Element NI, the only HipHop charity operating in Northern Ireland. We are dedicated to empowering our youth through creative HipHop disciplines, with focus on mental and physical health awareness. 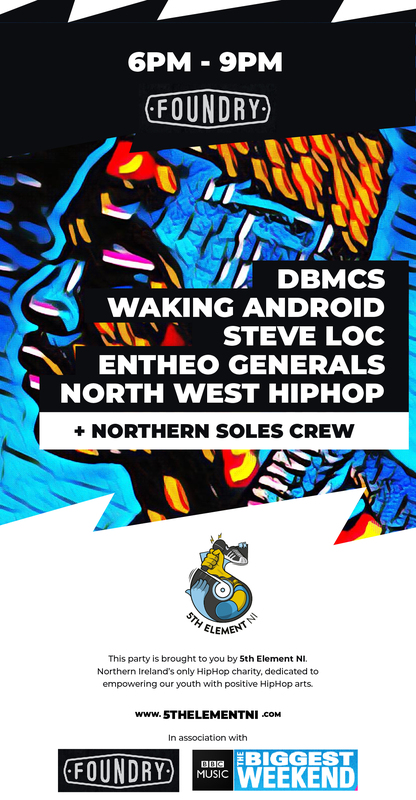 Another free event (18+) for all HipHop enthusiasts, featuring some of Northern Ireland’s freshest HipHop artists. MCs & DJs from around N.I will be putting on a live showcase. Expect high energy, and non-stop head bobbing! Get your dancing shoes on! Come & join the party on May 26th!